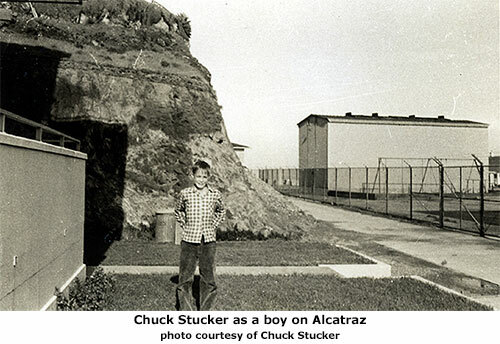 Chuck Stucker grew up on Alcatraz Island because his father was a guard in the prison. 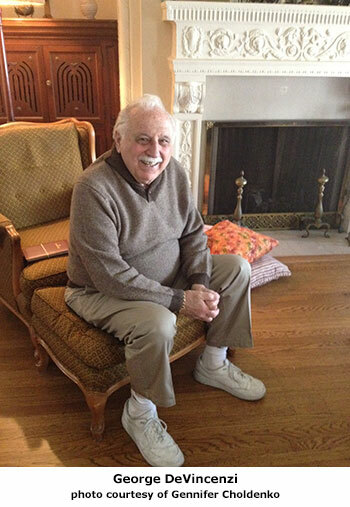 He lived on the island from 1940-1943 and from 1948-1953. 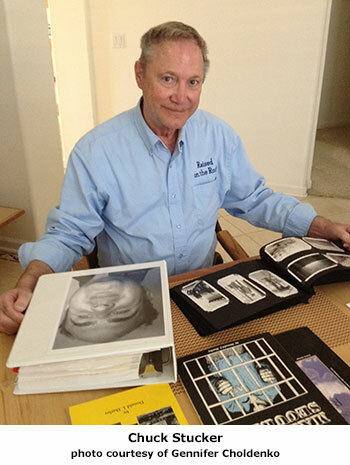 He is a well-respected Alcatraz historian and archivist. 1. Did your parents ever worry about you living on the island? They never voiced any concern. We didn’t lock our doors. Not everybody opted to live on Alcatraz. Some felt the community on Alcatraz was too small. Everybody knew everybody’s business. 2. What was the scariest part of living on Alcatraz? My only fear was being caught in a place I shouldn’t have been. We heard that our fathers could be fired if we got in trouble. 3. What was your favorite Alcatraz prank? The second one is a bit like you have in Al Capone Shines My Shoes. We were climbing between the floors of 64 building. Bill told me don’t step off the 2×4 supports. My foot slipped. It didn’t go through the ceiling but people noticed. They yelled “Earthquake.” When we got back, everyone asked us if we’d felt the earthquake. The crack is still there. 4. Did you ever break an Alcatraz rule? I broke all sign rules. Anything that said: DO NOT ENTER. Any fence or sign was subject to a violation. 5. Did you need to treat your father differently than you might have ordinarily? I was told never to jump out and say: “BOO.” We couldn’t surprise them because they were always on alert. 6. Did convicts ever seem like they knew you? We used to help the convicts load the laundry and the trash on the truck. They just seemed like adults to us. My sister was older and she remembers the cons that had trade talents—plumbers and electricians—coming into our home to help us out. Once a convict asked her if we were the Stuckers from Leavenworth. That upset her. Yes. I met Montgomery who was a pass man for Warden Swope. I used to fish with Warden Swope’s wife. I would knock on the Warden’s door and Montgomery would answer. 8. Were you ever on the island during an escape attempt? Yes, but I was a baby at the time. 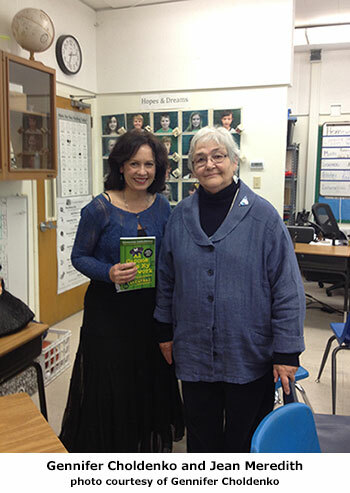 I do remember hearing rebellious behavior in the cell block. The prison population would rattle cups on the bars, yell and scream. My sister remembers hearing the escape siren going off. The protocol was to lock yourself in your apartment and wait. The fear was that a convict would grab a hostage. 9. What do you miss the most? The social group and the fishing. There was no limit to the amount of fish you could catch. No game warden. You didn’t need a license. I caught capazoni, eel, perch, sting ray, sand and leopard sharks up to four and five feet long. 10. Any do-overs? What do you wish you’d done now that you didn’t do then? Every kid wanted to go in the cellblock. You had to be twenty-one years old to get in there. 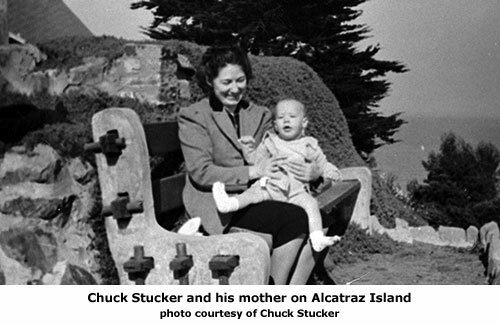 This was eight years after my father left Alcatraz. I wish I had asked that convict his name or his Alcatraz number. But I was so surprised, I didn’t. I don’t know how he picked me out of a group of twenty-five. The prisoners knew who everyone was. 11. Can you describe your first look inside the cell house? It was intimidating. It felt like I was in a zoo. I did not want to stare. 12. There are a million myths about Alcatraz. How would you like to set the record straight? The Alcatraz myths were created by the secrecy and Hollywood. In the thirties, media was not allowed on the island. The inmates who were released gave interviews, which only added to the mystery and the mystique. The press was never allowed to come and take a look. To me the real events are more interesting than the fiction. 13. Why do you think you are so fascinated by the island? I guess I started collecting information about Alcatraz, because I saw the history was being lost. 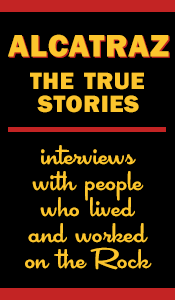 I wanted to make sure people’s stories were recorded. I wanted to be a keeper of information. 14. 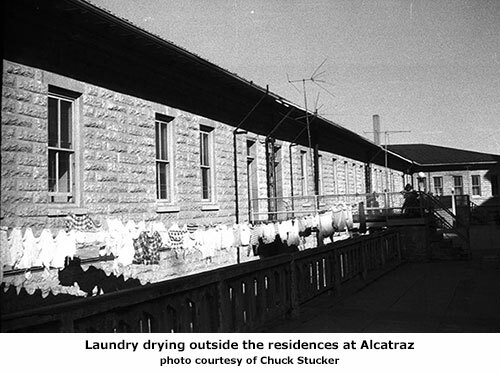 What is the strangest true story you know about Alcatraz? Prisoners on Alcatraz knew everything there was to know. Cons knew about Pearl Harbor before the guards did. They had their own sources of information.